Bauhinia Genome has focussed on teaching the people of Hong Kong about genomics by studying the DNA sequence of our emblematic flower Bauhinia blakeana. Now our neighbour cities of Guangzhou in Southern China, and Kaohsiung just across the Taiwan Straits, have joined the floral genome club, with their city flower sequenced. Bombax ceiba L., the red silk cotton or kapok tree, is famous and loved for its magnificent red flowers, and is also know as the guo tree, banchih tree, hero tree, panjhih flower, wood cotton, or the fireworks flower. It is also economically important as a source for fiber, food, and timber. The new “Ceiba Genome” resource just published today will also help scientists to better understand how the tree is adapted to its original dry valley habitat. In Hong Kong, our parks and gardens are full of beautiful floral trees, that colour and enhance our urban landscape. Other than the summer months when they don’t flower, the three main Bauhinia species brighten up the open spaces the Hong Kong for most of the year, and are rivalled in the early spring by the fleshy red petals of red silk cotton tree (Bombax ceiba L.). No wonder then that the citizens of Kaohsiung in Taiwan voted the iconic plant as its emblematic city flower, and it is also the city flower of Guangzhou. Apart from its beauty, the tree, which can grow up to 40 meters, has a number of uses: The kapok-like fiber inside capsule is used for pillows and mattresses and dried flowers are a popular basis for tea, soup or congee. In this part of the world you may have noticed people drying the flowers in the street. Traditional Chinese Medicine even attributes health benefits to the plant. Hong Kong is not the only emblematic flower that is edible and medical. Despite B.ceiba being widely cultivated in humid Southern China, there is a city named after this plant in a dry-hot part of the upper Yangtze River. This wide range may reflect its tolerance to extreme drought and heat. 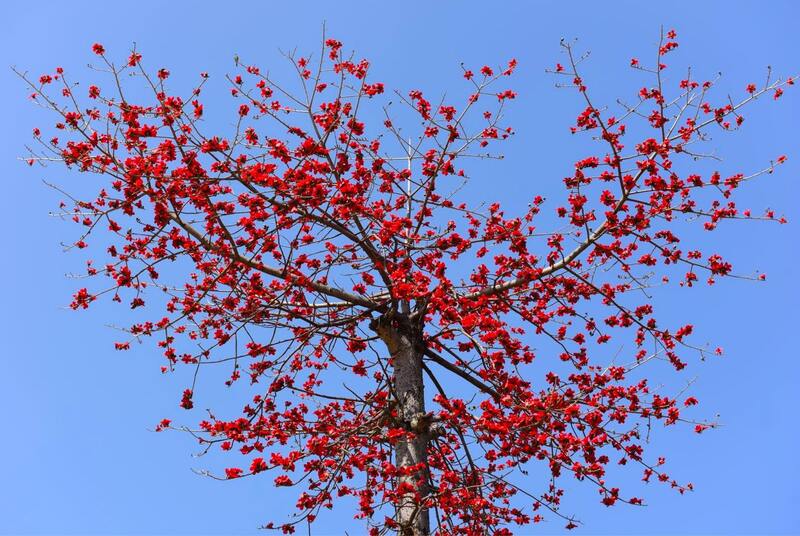 A team of Chinese scientists led by Lizhou Tang and Bin Tian of Qujing Normal University, Southwest Forestry University, have just sequenced and assembled the genome of this remarkable tree, and the results are just out in the journal GigaScience. They combined different genomic techniques to produce a resource of outstanding technical quality. The final genome assembly is 895 million bases (DNA letters) long, and containing roughly 52,000 genes. When scientist determine the genome sequence of an organism, they cannot just “read” the DNA letters of an entire chromosome from end to end. Instead, bioinformaticians reconstruct the genome from a large number of small pieces. Until a couple of years ago, the dominant technique to produce these sequence fragments, called “short read” sequencing, was a cost-effective method with one major drawback: The individual fragments were very small, not more than a couple of hundred DNA letters each. The resulting genome assemblies had a large number of gaps. More recently, a new technique, Single Molecule Real Time Sequencing (SMRT), has become more widely available. The technique produces longer stretches of continuous sequence, and the researchers used this additional source of high-quality data to reduce the number of gaps in their reconstruction of the Bombax ceiba genome. To improve the quality and usefulness of the genome data even more, they then combined the sequence data with information from so-called “optical maps”. This method works by labelling DNA fragments of different sizes with fluorescent markers, making it possible to sort and orient the pieces, to provide an optimal representation of the actual chromosomes. These techniques have been tried and tested before by other researchers with a number of plant and animal species, and now helped to produce a high quality genome assembly of the red silk cotton tree. Like our Bauhinia data, this ceiba genome data is available to download from the open GigaDB repository. “We intend to use the new genome resource to help with our future breeding projects of the red silk cotton tree”, Professor Tang points out. The data will also be used to better understand the adaptation of the tree to its natural habitat in dry valleys, and the authors already identified a couple of potential leads for genes that may be involved in this adaptation to quite extreme habitats. This work provides useful lessons for the study of our Bauhinia genome, as our complex hybrid genome will likely require the use of these new “long read” and optical mapping technologies to be able to assemble it. It also provides useful resources for comparative genomics, as we resolve the relationships and evolution of plants and all living organisms. Being able to better understand these connections, helps us better understand how we can take action to care for biodiversity and support the great Tree of Life that connects all species on earth. See the amazing short film TreeTender for further inspiration and insight here.